This novel scaffold aims to enhance the repair of bone injuries and fractures. It incorporates shape memory polyurethane foam and hydroxyapatite, a bone tissue component. The shape memory material enables the scaffold to be shaped at 0°C and entrenched with this shape at room temperature. It can take its former shape at 40°C. The scaffold can thus fit into the uneven bone defects, and the interim temperatures make it ideal for minimally invasive surgical procedures. 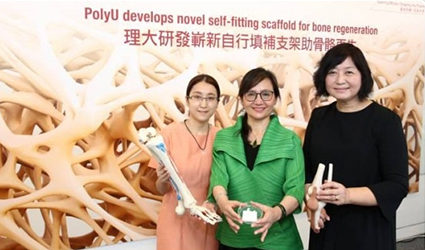 The bone scaffold has a porous, interlinked make-up facilitating cells to travel and generate new tissues. The average pore size of the scaffold is almost equal to that of the interior layer of bone, enabling replication of the real in-vivo microenvironment. The optimal composition is about 60% of space voids. Moreover, the scaffold proved biocompatible and did not produce any cytotoxicity when tested under laboratory settings. It also had the potential to cause the generation of osteoblasts and blood vessels. During research, 18 rabbits with femoral bone defects were implanted with the new scaffolds condensed to about half of their original size. When stimulated with 40°C saline, the scaffolds enlarged from their condensed shape to pack the defect within 60 seconds. 12 weeks post the surgery, a quicker bone tissue ingrowth in volume was observed. Results showed 46% of bone ingrowth in implanted rabbits as compared to 24% in the control wing.